A medical crisis is currently unfolding that’s left the life of one of the most prominent American statesmen hanging in the balance. According to major news outlets across the country, former President George H.W. 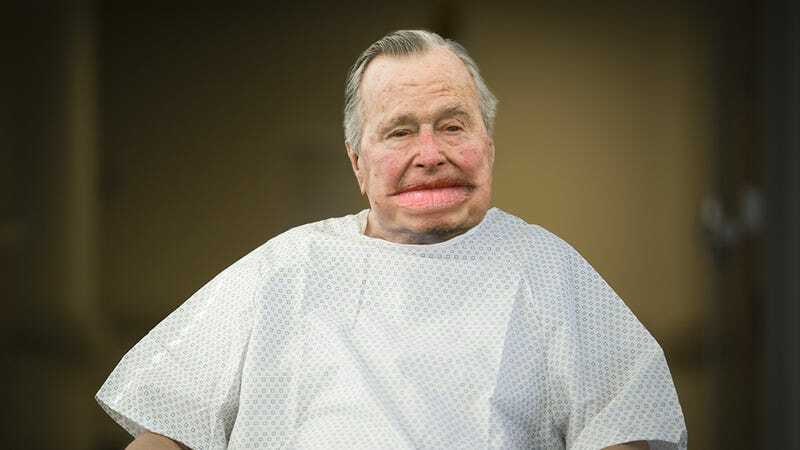 Bush has been rushed to the hospital for emergency lip gigantification surgery. Numerous sources have now confirmed that earlier today the former president was transported to the emergency room at Houston Methodist Hospital after doctors realized his lips needed to become insanely massive as soon as possible. For the past several hours, the 94-year-old has remained in critical condition while a team of doctors has worked frantically to make his lips the size of his head. Fortunately, surgeons say that they’ve managed to enlarge the former president’s lips to the point where they obscure his entire face. This has helped place Bush in a more stable condition where his lips are absolutely gargantuan and look like two pool noodles plastered onto his mouth. Sadly, though, unless doctors can quadruple the size of Bush’s lips so that they engulf his entire head and droop down to the floor, they fear the worst. After a year of health scares, here’s hoping that President Bush can once again bounce back and that doctors will be able to give him the giant lips he needs in order to survive. We wish him a speedy recovery!